The Goldenberg family on vacation in Sun Valley, Idaho, in 2008. Left to right, Paula, David, Ben. Early on, Paula “Charlee” Congleton Goldenberg ’79 noticed “little differences” in her newborn son David. His face was apple-sweet and round, but his ears were cupped. He had beautiful eyes but one of them twitched oddly and often. At two weeks of age, his arms would tense and his legs would stiffen “like a tiny fencer.” Gradually, the twitching spiraled into grand-mal seizures every half-hour. When, at 13 months, David was finally diagnosed with DiGeorge Syndrome, Goldenberg rushed him from Portland, Ore., to Children’s Hospital of Philadelphia, a treatment center for his genetic condition. She remembers the time and place as if it were yesterday because, 14 years later, Goldenberg works as a genetics fellow at the same hospital that treated her son. DiGeorge Syndrome, also known as 22q11.2 Deletion Syndrome, is an abnormality on the 22nd chromosome that spontaneously occurs (70 percent) or is inherited from a parent with the disorder (30 percent). It can cause heart defects, immune deficiency, cleft palate, delayed development, learning disabilities, and a battery of social and emotional issues. It occurs in one out of an estimated 4,000 births, nearly the incidence of Down syndrome. It was when her son David became ataxic and “started walking like a little drunk man” that Goldenberg began to rethink her career. Dr. Beverly Emanuel, chief of the Division of Human Genetics and Molecular Biology at Children’s Hospital, developed the laboratory test — a DNA probe — that identified David’s chromosomal deletion. Goldenberg, too, had been doing her own research, poring over reports about 22q11. In the process, she learned that Emanuel’s colleague, genetic counselor Donna McDonald-McGinn, was directing a study of patients with the syndrome. Goldenberg contacted the hospital, and McDonald-McGinn invited David to be part of the study. Goldenberg was 38, married with children (David and Ben, now 18) and licensed as a child and family therapist. (She has since divorced.) Consumed by David’s condition, her own domestic world threatened to spin out of orbit. At one point in his illness, David was seeing a developmental pediatrician, psychiatrist, ophthalmologist, nephrologist, urologist, neurologist, ear-nose-throat specialist, immunologist, developmental therapist and endocrinologist. It was when he became ataxic and “started walking like a little drunk man” that Goldenberg began to rethink her career. The “Cecil Textbook of Medicine” had become daily reading. Maybe, she thought, she could contribute to healthcare in a different way — and better understand her son’s condition in the process. 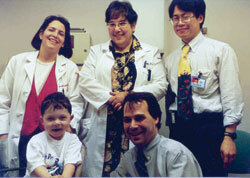 David Goldenberg, now a freshman in high school, still has regular appointments with doctors and specialists. He suffers from scoliosis and wears a brace more than 18 hours a day. He needs special assistance at school, and has regular visits with Dr. Elaine Zackai, the geneticist who attended to David when he came to Children’s Hospital as a baby. Yet, his remarkable progress continues, and his cheerful disposition hasn’t flagged. Of course, he does sometimes visualize “blowing up his brace with firecrackers after surgery for his back,” Goldenberg said. Goldenberg started a listserv — now 500 subscribers strong — for 22q patients and their families. Then the larger picture emerged. Seventeen years and two degrees after graduating from Whitman, she passed the Medical College Admission Test, applied to schools and enrolled at Oregon Health & Sciences University to become a medical geneticist. At OHSU, the annual white-coat ceremony is observed at the start of study rather than in the transition from preclinical to clinical health. Goldenberg’s family was on hand to see her “cloaked” in a first-year’s small white medical coat. After the ceremony, David offered a brief critique. “You need more stuff in your pockets, mom,” he said. A few years later, Goldenberg had so many instruments in her white coat that the pockets burst at the seams, and she had to staple them shut to carry on with her work. “There was a lot to take in, but my schedule was humane,” she said. After OHSU, Goldenberg interviewed at 11 residency programs, wanting one that was equally strong in genetics and pediatrics. She found a match at Duke University and spent her first three years in pediatrics. There she cared for patients in need of thymus transplants, some of whom suffered from 22q11 deletion. In 2004 she was appointed medical director of the International 22q11.2 Deletion Syndrome Foundation on the nomination of Emanuel and McDonald-McGinn. Goldenberg hasn’t stopped there in her quest to help victims of an insidious condition. With the support of the pediatrics and genetics programs at Duke, she started a 22q clinic at the medical center. She also volunteered to be a director of “Victory Junction,” a summer camp in North Carolina for children with chronic medical conditions or serious illnesses. Last year, she was appointed chair of the board of directors of the 22q11.2 Deletion Syndrome Foundation.